The fabled "Magazine of the West" is moving, but not before one last fan festivity in its longtime digs. MYTHICAL MENLO PARK: If you had ten publications spread before you, and you had to match them to ten cities on the map, the magazines' homebases, could you do it? Well, sure, "The New Yorker" is kind of an easy one, as is any city-focused magazine with the town's name on the cover. But how about those long-running favorites that aren't readily associated with any particular place by their theme or style? That becomes a bit trickier, save one magazine that's synonymous with the West: Sunset. Readers of the monthly know Menlo Park nearly as well as anywhere, even if they've never visited the California hamlet. That's because Sunset's bring-the-outside-inside philosophies -- and vice versa, of course -- were made real, and incredibly picturesque, at the magazine's Menlo Park headquarters. CELEBRATION WEEKEND: Part of the reason Sunset's basecamp has been so familiar to fans is that, unlike many publications, it is open to visitors, or at least a portion of the outside area: The gardens are open for self-guided tours. But even if you never made it to Menlo Park, you know it from the snapshots of the rustic-posh property seen in Sunset's pages. 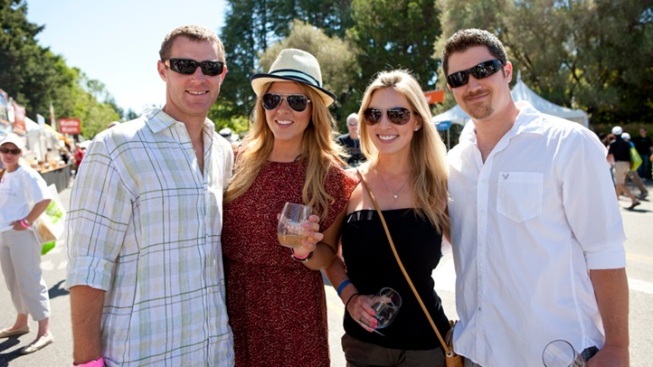 Sunset, however, is moving later this year following the sale of the property, and its upcoming Celebration Weekend, a staple on its social calendar, will be its last in the Menlo Park location. Which means this: If you've been meaning to commune with all of that Menlo-ness that has become rightly mythologized over time, Saturday, June 6 and Sunday, June 7 are the dates to do so. THE SEVEN-ACRE CAMPUS... will brim with Western living-focused to-dos, from ideas for planting drought-tolerant flora to DIY printmaking to the maximizing of tighter nooks. It's year 17, so many people -- "tens of thousands" -- are expected to join the home-and-more bash. Cuisine is at the heart of much of what Sunset is about, and there shall be two cooking stages, stages that shall feature the feats of major toques like Martin Yan, Chris Cosentino, and Joanne Weir. And will there be a Wine Lounge and beer seminars, too? There shall be. Sunset hasn't yet revealed its future home, but with the popularity of the Celebration Weekends, and the devotion the 1898-begun magazine regularly engenders, we can only imagine everyone, staffers and fans alike, will take the spirit of the Menlo Park headquarters onward to the next stop down the line.